Reprinted from The Red Book by C. G. Jung. Copyright © 2009 by the Foundation of the Works of C. G. Jung. With permission of the publisher, W. W. Norton & Company, Inc. All rights reserved. Given the vast breadth of C.G. Jung’s researches in world literature, it is remarkable that he chose familiar texts from the Judeo-Christian biblical tradition to illustrate the defining introductory pages of his Liber Novus, The Red Book. The curious reader wonders what those particular texts revealed for Jung and the thoughtful reader ponders implications for one’s own psychic life. In the Fall 2014 edition of Depth Insights, this author related the four biblical passages quoted on the elaborately scripted and illustrated frontispiece, Der Weg des Kommenden, of The Red Book to C.G. Jung’s own life situation at midlife (Kegler 2014). In similar fashion Jung opens the second part, Liber Secundus, of The Red Book with an elaborately painted initial, “Die Bilder Des Irrenden” (The Images of the Erring), and five verses from Chapter 23 of the biblical book, Jeremiah. 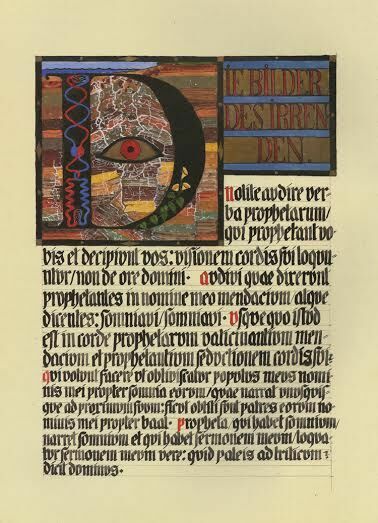 These verses are taken from Vulgate Latin version and rendered in Jung’s own calligraphic script. The initial and the script material fill the entire page. This article will explicate the Jeremiah verses using agnostic biblical criticism to amplify Jung’s use of these particular verses to represent his experience as preserved in Liber Secundus. It will suggest further parallels between the prophetic roles of Jeremiah and Jung. The large “D” from the title, “Die Bilder Des Irrenden,” is encased in a narrow black square border with tiny celestial bodies. Within the square appear foundational rock strata upholding a small area of sea and sky at the top. Particularly within the “D,” these strata exhibit fissures or cracks suggesting compromise of the very foundation. The image is much like contemporary images of fracking for oil. Dominant within the “D” is an all-seeing and all-discerning eye-of-God. These verses are much about discernment between authentic and false prophetic voices. Also within the very script of the “D” is an intertwined blue and red figure suggesting a conjoined living artery and vein. Finally, within the script of the “D” is a growing new vine with leaves and three blossoming yellow-gold flowers. Though there is fragmentation and disruption, new life is flowering. In The Lament of the Dead: Psychology after Jung’s Red Book, Hillman and Shamdasani (2013) wrote in dialogue about Jung’s use of language in The Red Book, asserting that Jung is “using descriptive language or concrete words about what is going on in the psyche, not second level abstractions…. And somehow this must create maybe a six or seven tremor in the underground…. We can maybe hear it underneath us” (p. 10). In the case of this initial, Jung uses concrete painted imagery of fissures rather than words. For the English translation of the Jeremiah text Shamdasani chose the classic 17th Century King James Version as he did also with the biblical texts in the frontispiece and as Hull did consistently in the Collected Works. After a review of several English versions translated from the Hebrew original, the New Revised Standard Version was chosen here for clarity of language. In the commentary to follow, nuances from other translations will be used to amplify meanings. The text begins, “Thus says the Lord of hosts: Do not listen to the words of the prophets who prophesy to you; they are deluding you. They speak visions of their own minds, not from the mouth of the Lord” (Jer 23.16). Nuances for “they are deluding you” include: “they are giving you empty talk” (Alley 2008); “they make you nothing” i.e. by prophesying hopes that will come to naught (Lundbom, 2004); “filling you with vain hopes” (Carroll 1986); “make you vain” or “mislead you” i.e. puff you up with false sense of security (Latin “decipiunt”); “buoy you up with false hopes” (New English Bible). Regarding “visions of their own mind,” the Hebrew word “leb,” (here rendered “mind”), is more literally translated “heart,” and carries the concept of heart as seat of mind and will. The Vulgate Latin has “cordis” (heart) the German has “hertz” (heart) and the English translators sometimes use “heart” and sometimes “mind.” Bright’s (1965) translation is strongest in calling these prophets’ visions “self-induced.” Such personal visions are false in that they are proclaimed to be the very word of Yahweh for the community and in that way they delude or mislead the people. Just using the formula phrase, “Thus says the Lord,” with their pronouncements does not make it so. Professional cultic or court prophets in the Ancient Near East often worked themselves up in ecstatic frenzy and in that state preached the self-initiated message for dramatic effect and an air of divine authenticity. To qualify as ‘prophetic’…a dream simply must draw its images from deeper psychic levels than the personal unconscious, casting its net of associated contents well beyond the individual dreamer’s situation and personal concerns. It must present … with images of discernible collectivity (p. 20). Big Dreams: The Science of Dreaming and the Origins of Religion (Bulkeley 2016) confirms the distinction in levels of dreaming and describes the brain-mind infrastructures involved. This use of a passage from Jeremiah in both The Red Book and Psychological Types parallels Jung’s use of Isaiah passages in both The Red Book and Psychological Types. (Kegler 2014) It seems these two biblical prophets inhabited the conceptual and imaginal field Jung was living and working in at that time. Even as he entered into dialogue with his unconscious in the evening, he was maintaining his clinical and academic practice, studies, family life and military service by day. (Shamdasani, 2009) In particular, Jung (1961) commented that in the period 1913-1917 his intense attention to the images of his unconscious and his work on Psychological Types were simultaneous. Like Isaiah, Jeremiah and the followers of the Christ, Jung was discerning the way that is to come from the disparate voices of error in the spirit of their times. In the spirit of Jeremiah’s time, the role of prophet was well established in Ancient Near Eastern courts along with that of king and cultic priest. Often operating in bands, these professional prophets were conceived of as messengers of direct communication from the gods. Their oracles were consulted for guidance in the affairs of state. As noted above, their charismatic affect and pronouncements were often generated in ecstatic trances. Stereotypically, they were sycophants whose self-interest was to please the establishment with messages consistent with that of the current mind of the king and community. In sharp contrast to these professional prophetic clans, the classical biblical prophets (e.g. Isaiah and Jeremiah) acted on their own. They are depicted as experiencing a “call,” a profoundly numinous revelation of Yahweh, the god of their faith tradition. This prophetic role was not of their choosing and they often wished themselves out of it. Jung (1953) made a distinction between authentic and inauthentic prophets: “Every respectable prophet strives manfully against the unconscious pretentions of his role. When therefore a prophet appears at a moment’s notice, we would be better advised to contemplate a possible psychic disequilibrium” (para. 262). In biblical tradition prophetic revelations from Yahweh often took the form of short poetic oracles which most often were radical critiques of the current religious and political situations. Speaking truth to power, the prophet’s messages were unwelcome and largely unheeded. These oracles were preserved, retold and expanded in long oral traditions and eventually edited and written into canonical “books” which bear the prophet’s name. Abraham Heschel (1955) wrote, “The year (627 BCE) in which Jeremiah received his call to be a prophet was a turning point in [Israel’s] history” (p. 130). The Northern Kingdom of Israel had fallen to superpower Assyria in 710 BCE, the people were scattered throughout the empire and mostly lost to history. The tiny kingdom of Judah with kings in the line of founding king, David, lived on in relative security and peace as Assyria’s vassal for another 100 years. Assyrian king Ashurbanipal died in 627 BCE, leaving the empire in a state of weakness and near collapse. The rival superpower, Babylon, drove Assyria out of the region and Judah was caught in the resulting political vacuum as Babylon and Egypt vied for control of the tiny kingdoms on the coast of the Mediterranean. Judah’s strong king, Josiah, hoped to remain independent and ambitiously expand the kingdom by reclaiming the lost territory of the former Northern Kingdom of Israel. He was killed in battle trying to stop Egypt’s army from passing through Judah to ally with the remnant of Assyria against Babylon. His weak successors and his anti-Babylon party also dreamed of independence and plotted ill-fated revolts even as they had to submit as vassals to either Egypt or Babylon in their tug-of-war. Jeremiah was of the minority pro-Babylon faction and well aware of the inevitable Babylonian juggernaut. His preaching in that vein was relentless and it nearly cost him his life (Mckenzie, 1965; Sweeney, 2000; Bright, 1965). There was a significant religious reform under King Josiah early in Jeremiah’s time. It was inaugurated and sustained by a different version of the Law of Moses preserved in the Northern Kingdom and rediscovered in Jerusalem in 621BCE. This book of law and interpretation came to be known as and preserved in the biblical book, Deuteronomy, as “Second Law.” Josiah’s reforms did centralize worship practice in the Jerusalem temple while shutting down worship at local temples more involved in the syncretic practices described by Bright. From Jeremiah’s point of view, it was largely a reform in external cult practice rather than a spiritual renewal of the people. It did not touch their hearts. Jeremiah is aptly described by his later editors as a “prophet like Moses” (Sweeney 2000). His foundational spiritual conviction was absolute adherence to the covenant set in Moses’ time between Yahweh and the people. The covenant terms were simple enough. The faithful were to follow the moral and cultic Law of Moses and in turn Yahweh would be there for them in prosperity and against all adversaries. Cultic practice, however reformed, was never sufficient. Thus Jeremiah tirelessly preached. He prophesied that the covenant was essentially broken; and that eventually Yahweh—utilizing pagan King Nebuchadnezzar of Babylon as “my servant”—would execute consequential punishment. Another and perhaps more dominant theological perspective in Judah had been championed by the prophet Isaiah (Kegler 2014). It was founded in Yahweh’s promise to reside with the people in the temple in Jerusalem and stand by the succession of Judah’s kings in in the line of David. The messiah was to be a future Davidic king. With that assurance, it was unimaginable that Jerusalem would suffer devastation at the hands of Babylon or any other earthly power. It is thus not possible to state definitively when Jeremiah might have laid down the charges against his fellow prophets recorded in Chapter 23 and quoted by Jung. The broader section, verses 9-40, is a collection of oracles against the prophets presumably uttered in disparate (and desperate) times and places and probably more than once. Scholars generally agree these oracles read well in the reign of the last king of Judah, Zedekiah. In 605 BCE Babylon definitively defeated Egypt and Judah’s rightful king, his court and about 10,000 people were taken to exile in Babylon. Nebuchadnezzar set up Zedekiah to rule the remnant. The influential anti-Babylon faction pressured Zedekiah into an ill-fated revolt even as Babylon’s army approached the very gates of Jerusalem. Nebuchadnezzar came down hard, destroyed Jerusalem and the temple, and another large group of the people was hauled off into exile in Babylon. Though a remnant including Jeremiah remained, the kingdom of Judah was no more. Jeremiah was proven right all along. Had Zedekiah or prior kings heeded his message of heartfelt repentance and submission to Babylon the ultimate devastation may have been avoided. The prophets condemned by Jeremiah were upholding the spirit of Davidic invincibility. There deceitful messages are summarized by Lundbom (2004), “preaching peace and security for Judah, disobedience to Nebuchadnezzer and a quick end to the imposed exile” (p. 204). Throughout Jeremiah’s ministry and particularly in the last days of Judah, these vain hopes fostered by the anti-Babylonian party, a succession of Judah’s kings and their court prophets did delude the people with false security and deserve Yahweh’s wrath. As Bright (1965) stated, “It was a time when prophetic word was hurled in the teeth of prophetic word and Israel’s God was invoked in diametrically opposite courses of action” (p. CVI). Definitive criteria for discerning true from false prophecy are not evident; but the seat of discernment seems to be the human heart as the seat of mind and will. Those who know Yahweh in their deepest heart would recognize His valid word wherever spoken. After the fall of Jerusalem and the great exile, Jeremiah’s message became one of consolation rather than judgement. We are being justly punished for our breach of covenant, he might say, but Yahweh is not finished with us yet. For Jeremiah “Der Weg Des Kommenden” is a new covenant which will not be a new set of laws but the valid laws of the former covenant written on the very hearts of the re-gathered tribes of both Israel and Judah (see Jer 31.31-34) “I [Yahweh] will give them one heart and one way” (Jer 32.39) or as Bright (1965) rendered it, “I will give them singleness of mind and of purpose” (p. 290). Then will the human heart be in synch with the very mind and will of Yahweh. As McKenzie (1965) stated it, “Yahweh will make Himself known to each person as He once made Himself known to Moses and the prophets…. [thus] the beginning of ‘personal’ as opposed to ‘institutional’ religion” (p. 423). Armstrong (2006) described this “great transformation” this way, “Having lost everything, some of the people of Israel were turning within…to discover the more interior and direct knowledge of the Axial Age” (p. 170). Jeremiah and Jung have commonality well beyond the five verses quoted in The Red Book. In parallel fashion, both Jeremiah and Jung had core intuitions with eventual broader fulfillment. Jeremiah’s initial numinous intuition and abiding conviction was the foundational reality of Yahweh’s covenant relationship with the people of Israel. His crowning prophetic intuition was a new way, a new covenant written in the very hearts of individual people. Jung’s initial intuition and conviction was the reality and autonomy of the collective unconscious and his crowning prophetic message in The Red Book was the way of individual access to the unconscious through active imagination in pursuit of individuation, Der Weg des Kommenden. Armstrong, K. (2006). The Great Transformation: The Beginning of Our Religious Traditions. Armstrong, K. (1993). A History of God: The 4000-Year Quest of Judaism, Christianity and Islam. Bright, J. (1965). The Anchor Bible, Jeremiah: Introduction, Translation, and Notes. Bulkeley, K. (2016). Big Dreams: The Science of Dreaming and the Origin of Religion. Hillman, J. and Shamdasani, S. (2013). Lament of the Dead: Psychology After Jung’s Red Book. Jung, C.G. (1961). Memories, Dreams, Reflections. Jaffe, A. (Ed.). New York, NY: Vintage Books. Jung, C.G. (2009). The Red Book: Liber Novus. New York, NY: Norton. Lundbom, J.R. (2004) Jeremiah 21-36: A New Translation with Introduction and Commentary. New York, NY: Doubleday. McKenzie, J.L. (1965) Jeremiah. In Dictionary of the Bible, Milwaukee, WI: Bruce. Shamdasani, S. (2009). Introduction. In The Red Book: Liber Novus by C. G. Jung. New York, NY: Norton. Sweeney, M.A. (2000). Jeremiah. In Freedman (Ed), Eerdmans Dictionary of the Bible. Grand Rapids, MI: Eerdmans Publishing Company. Gerald Kegler M.Ed is a long time member and past board member of the Minnesota Jung Association and five year student in the related Minnesota Seminar in Jungian Studies. Seminary training instilled a lifelong secular study of the Hebrew and Christian scriptures. This article combines both areas of interest and study for him.